In this Part, we will explore the meaning of the 17th Shloka of Sri Vishnu Sahasranamam. Bhagavan assisted Indra to regain his kingdom by taking the Vamana Avataar and sought Bhiksha from Mahabali. He transformed into a ‘Giant Trivikrama’ even as Mahabali was in the process of completing the Arghyam for gifting three feet of Earth. He is pure as he is unattached in his actions or in the fruits of his action. All his actions are in accordance with Dharma and to restore Dharma. 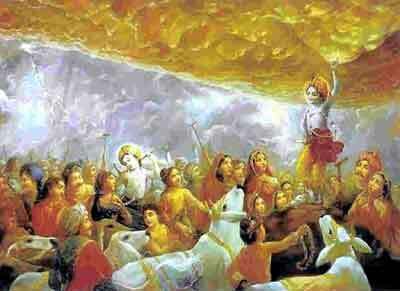 HE is superior to Indra and easily attained by devotees through Bhakti. He is the Creator of the Universe and also the Universe is within HIM. He supports all Jivatmas and controls all the functions that are essential to sustain the Universe. He is the Controller and controls the earth from outside and Jivatmas from within. Now let’s examine the meaning of the above Namas. The first meaning is that HE is the one who helped Indra. ‘Indram upagatah anujatvena iti Upendrah – He assisted Indra to defeat the Asura Vrtra and hence He is Upendrah’. ShrI Radhakrishna Shastri gives the following meaning in this context. The Asura MahaBali performed penances in accordance with Sage Shukracharya’s advice and obtained divine powers. He then defeated Indra and unseated him. Indra’s mother Aditi prayed to Lord Vishnu to get Indra’s position back. Since MahaBali had attained Indra’s position through penance, there was no way of getting back the position easily. So Bhagavan took the Vamana Avataar, by being born as the son of Aditi and the younger brother of Indra, to restore the position of Indra. He asked for a bhiksha of three feet of land from MahaBali in his YagaShala. Since Bhagvan was born as the younger brother of Indra and helped him regain the kingdom, HE is Upendra. The second meaning is that He is superior to Indra. ‘Indrasya upari Indrah – Sri Radhakrishna Sastri gives the example of Bhagavan proving superior to Indra. When Indra was trying to drown the Ayarpadi with continuous heavy rain (for not offering prayers to him), Krishna used the Govardhana Hill as a protective umbrella and defeated Indra’s aggression thus proving Himself to be stronger than Indra. As Sri Adi Sankara puts it ‘Balim Vaamana Roopena Yaachitavaan Iti Vamanah – He is called Vaamanah because he approached King Mahabali in the form of a dwarf and asked for three feet of land as bhiksha. ‘Vaamayati Tyaajayati Madam Balim’ – One who expelled the pride out of MahaBali. Vam literally means to emit, eject or expel and in this context it could mean that Bhagavan expelled pride out of MahaBali. ‘Vaamo valgutvam asya asti iti Vamanah’ – One who has a very charming short form. ‘Vaamo vatutvam asya asti iti Vamanah’ – One who has a short form of a Gurukula student, which is how MahaVishnu appeared in front of MahaBali to ask for three feet of earth from him. Meaning: One who bestows all the desires of the devotees, or one who produces joy in those who see Him, by His effulgence. In the Vaamana Avataar, Bhagavan very quickly transformed himself from a dwarf into a giant form and covered the three worlds under His two feet. 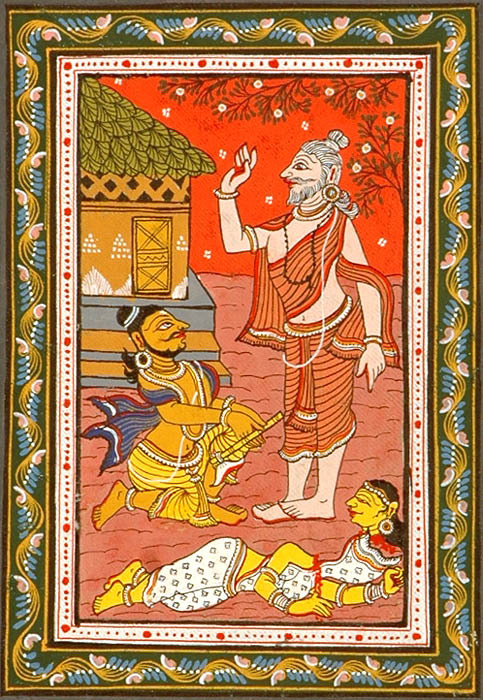 As soon as Mahabali began to perform the ritual of ‘Arghyam’ (pouring the water to accompany) for the gift of three feet of land to Vamanas, Bhagavan had transformed himself as the ‘giant Trivikrama’. The Lord manifested His Universal form. 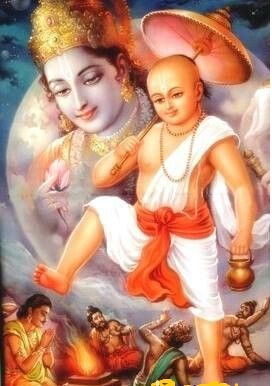 Sri Adi Sankara says ‘Sa Eva Jagat tryam Kramamaanah Praamshuh Abhoot iti Praamshuh – meaning the same person who came as Vaamana the dwarf became a “Giant Trivikrama” and covered the three worlds. Hence he is called Praamshuh’. The Nama Pramshuh can also be analysed as ‘Praashnute Prakarshena Oordhvam iti Praamshuh – One who gets transformed from a dwarf to a giant’. Amoghah appeared earlier in the 12th Shloka as the 111th Nama where we explained this to mean that HE always gives fruits to those who worship Him. We will see this analysed differently now as ‘Na Mogham Cheshthitam Yasya Sah Amoghah – One whose acts are never futile.’ This is a typical understatement in the Sanskrit language to imply that His acts are extremely productive. Every act of Bhagavan has a purpose and value. All his incarnations are orientated towards protecting the virtuous and destroying the wicked. His actions are examples on how to practice Dharma and are lessons for all humans. When Bhagavan asked for three feet of earth from MahaBali, it helped Indra; and when MahaBali could not give the third foot of earth, it helped subdue MahaBali’s pride and make him a great devotee of the Lord on the spot. Sucyata iti Shucih – One who purifies is Shucih. Bhagavan is Pure because He is the ParamAtmA who is uncontaminated by actions and their effects. We saw in the earlier shloka that he is Anaghah which means untainted. He is Shucih because One who contemplates on Him becomes pure, and thus association with Him makes one pure. Whatever He does is in accordance with Dharma and so His purity never diminishes. He is Pavitranam Pavitram, or purer than the purest. ‘Smarataam Stuvataam Archayataam cha Paavanatvaat Shuchih – He is called Shuchih because he purifies those who think of him, sing his praises or worship him in any which way’. Sri Satyadevo Vasishtha takes this interpretation one step further by pointing out that ‘Everything the Bhagavan does is resplendent with beauty that speaks of His purity’. All one has to do to realise this, is to look at the beauty of His creations such as flora and fauna, the waters flowing in the rivers etc. So He is all around us displaying His innate quality of purity constantly. Oorjaa means balam or strength. Sri Adi Sankara interprets this as ‘Bala Prakarshana Shaalitvaat Oorjitah – He is of proven strength.’ This is one of the Shadgunas of Bhagavan (Gnana, Balam, Aisvarya, Veerya, Shakti and Tejas). HIS strength is displayed whenever HE has had to take care of the demons. Sri Satyadevo Vasishtha points out that He is Oorjitah not only because of His own immense strength, but also because of HIM being the sum total of the strength of all his Creations, since He is the source. As is evident, through many of mantras, the devotee is asking for ‘balam’ from Bhagavan as HE is the source of ‘balam or strength’ in all His Creations. Parshurama is the Sixth Avatar of Lord Vishnu. He was born to Rishi Jamadagni and Renuka. 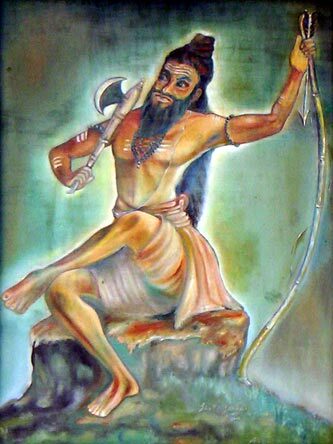 He is one of the seven Chiranjivis’ or immortals. The grandfather of Bhargava Parashurama was a great Rishi by the name Rucheeka, a direct descendant of Brahma. One day, the Rishi was travelling through the country and visited the court of the Chandravamsi King Gaadhi. The Rishi besotted by the beauty of his daughter Satyavati and asked King Gaadhi to have her as his bride. Considering him to be an unworthy match, the King was a bit reluctant but could not deny the request of the Rishi Rucheeka. He agreed to give his daughter away to the Rishi, but on the condition that Sage Rucheeka should give him one-thousand horses, all with one ear black and the body entirely white like a Moon. The Rishi agreed to the demand of the King and performed a penance to God Varuna. The Rishi was blessed with the horses that the King had requested and gave them to the King. The King had to fulfil his promise and thus the Rishi Rucheeka married Satyavati. Satyavati adjusted well to the ascetic life as she was blessed with a good attitude. Meanwhile, at the Kingdom, her father had no heir to the throne and this also worried Satyavati. Satyavati expressed the concerns of her mother for an heir to the Kingdom to Sage Rucheeka and also her desire to have a child. The Rishi prepared two potions and uttered two kinds of mantras (invoking a Brahmana for Satyavati and Kshatriya for her mother). He gave Satyavati both the potions, one for her mother so that she would have a mighty Kshatriya son and one for Satyavati so that she would have a son that would become a great sage and went out to bathe. Satyavati gave the potions to her mother. However, out of her love, Satyavati gave the potion meant for her to her mother as she thought that the Sage would have prepared her potion to be superior out of love for her. She had the potion intended for her Mother. In time, both the mother and daughter were expecting their child. Satyavati pleaded with the Rishi to reverse this. The Sage said it can only be postponed and said, let that be our grandson who will become the great warrior and our son will be a Rishi. Satyavati gave birth to a son, Jamadagni, who became a great Saptarishi, while her grandson Bhargava Parashurama was the sixth incarnation of Vishnu, and the greatest warriors of his age. 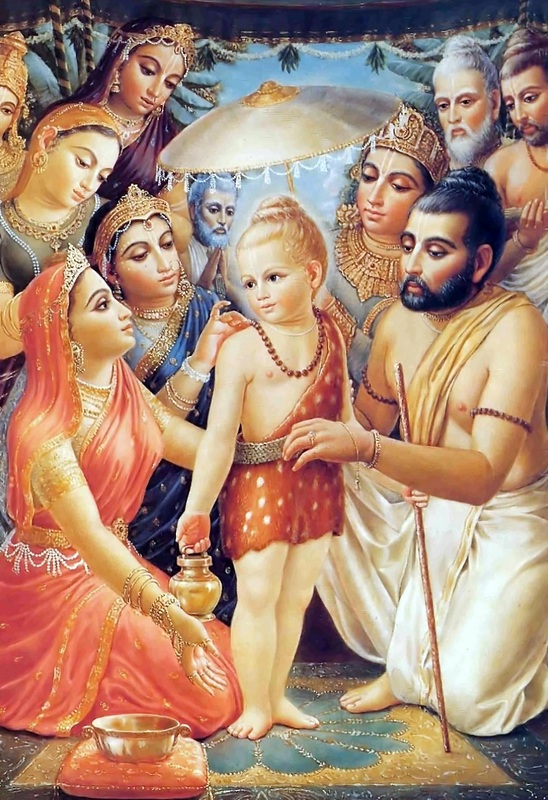 Before the birth of their fifth son, Jamadagni meditated with his wife Renuka for a divine providence. Renuka was known for her chastity and devotion to her husband. One day while at the river, a group of Gandharvas in a chariot passed by in the sky above. Filled with desire only for a moment, she hesitantly stood there for a while. Perceiving the delay thus caused for the Yagna, and terribly afraid of the Sage’s wrath, she returned with the pitcher and placed it before him and stood with joined palms. The Sage through his yogic powers perceived all that had taken place and was enraged. The Rishi called his eldest son, handed him an axe and asked the boy to kill his mother. Horrifed, the boy refused, and so Jamadagni turned him to stone. He then asked each of his sons, and they refused one by one. 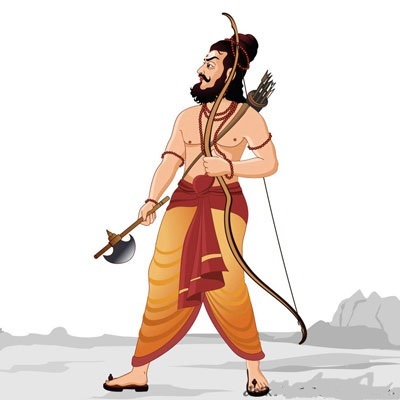 Finally he urged his youngest son, Parashurama, to slay his mother. Parashurama, confident of the Yogic powers and austerities of his father, beheaded his mother. The gratified Jamadagni asked Parashurama to seek a boon. Parashurama asked that his mother and brothers, be brought back to life. Impressed by the affection and devotion of his son, Jamadagni granted his request. They instantly rose whole again as if after sleep. 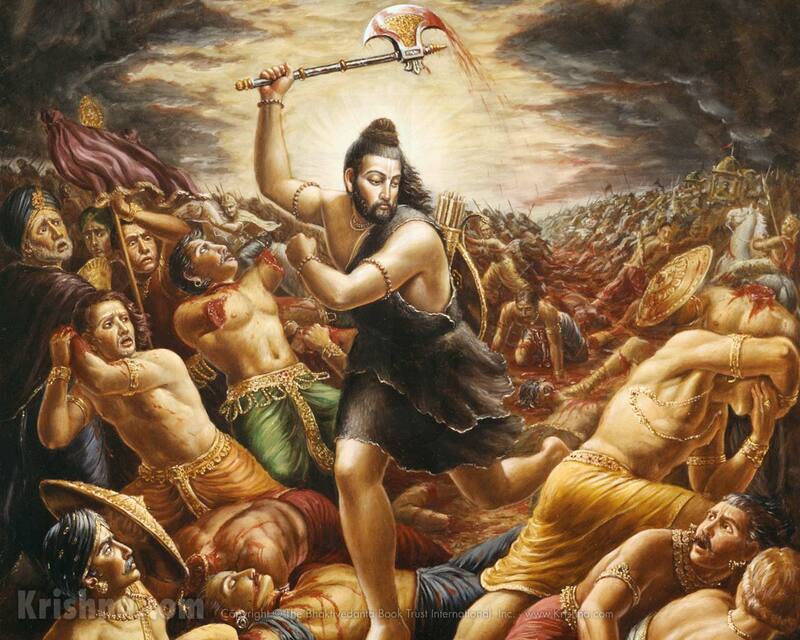 Parashurama axed his mother to death only because he knew the power his father’s penance. Parashurama lived within the Haihaya kingdom, located in modern day Maheshwar on the banks of the Narmada River. The Haihaya were ruled by a powerful and a cruel King named Kartavirya Arjuna. Kartavirya worshipped a divine being known as Dattatreya, who was an embodiment of the Trimurti and a descendant of the Saptarishi Atri. For his obeisance, Dattatreya had granted the King Kartavirya a flying golden chariot that would take him wherever he wished, and one-thousand arms. With these boons, Kartavirya became immeasurably powerful, conducting many military conquests after which he made Mahishmati in present day Maheshwar, the capital of his kingdom. Kartavirya became so powerful that he was even able to defeat and imprison the demon King Ravana at the river Godavari. 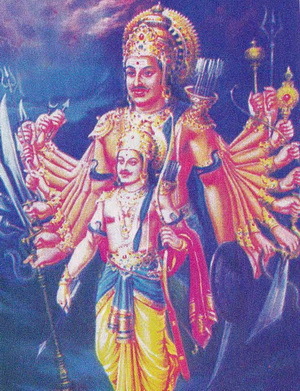 Ravana, in turn, would later be the nemesis of the Ramayana. One day King Kartavirya Arjuna came upon the hermitage of Jamadagni. Parusharama was away in the forest gathering materials for yagna, and although the king had a massive entourage, the Saptarishi was able to serve the king a grand feast. 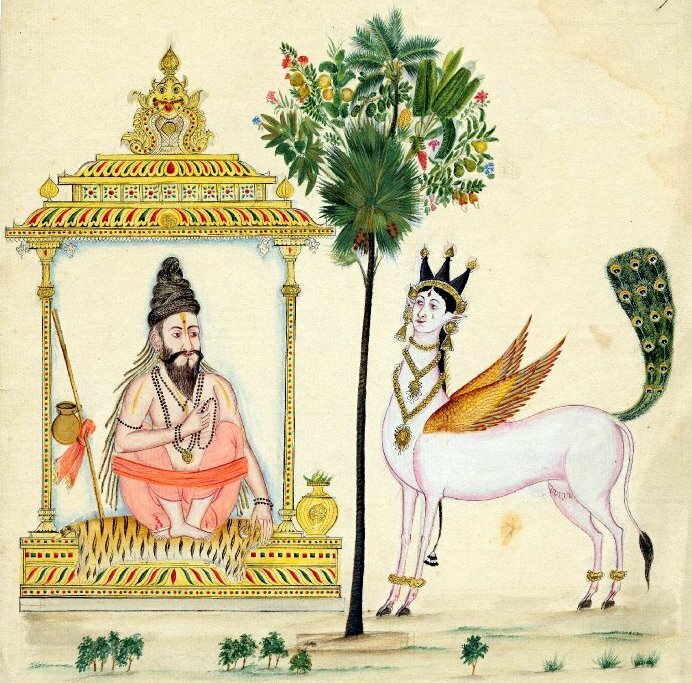 When Kartavirya asked how he was able to do so, Jamadagni showed him the blessed wish fulfilling cow Kamadhenu, given to him by Indra, which was able to grant wishes. In his arrogance, King Kartavirya Arjuna did not think it necessary to seek permission of the Sage, and commanded his men to take the wish fulfilling cow Kamadhenu and its calf. Returning home, Parashurama was infuriated upon learning what had happened. He chased the King and his men brandishing his axe, decimated all the guards and killed the mighty King Kartavirya, retrieving the cow and the calf. When he returned home, his father was pleased, but seeing the blood stained axe of Parashurama, he was concerned. He advised Parashurama to perform a penance to seek Lord Vishnu’s blessings. Parashurama accepted the reprimand of his father, and went into penance visiting many holy places for purification and returned after a year. Meanwhile, the sons of Kartavirya wanted to seek revenge and they killed Jamadagni and all those surrounding the Rishi, shooting them to death with arrows. Afterwards, they decapitated the body of Sage Jamadagni and took his head with them. When Parashurama returned home, he found his mother next to the body of his father, crying hysterically as she beat her chest twenty-one times in a row. Furious, he hunted down the sons of Kartavirya at the palace. He killed them all and returned with the head of his father to conduct the last rites. Parashurama then vowed to kill all war-mongering Kshatriyas twenty-one times over, one for each time the hands of his mother hit her chest. Parashurama then travelled killing all Kshatriya caste 21 times and created a tank in Kurukshetra filled with blood instead of water. He single handedly, with his axe and bow annihilated Kshatrias and their army 21 times over, thus showing his immense strength! One legend describes Parasharuma returning to a village after battle in what is now the Badami Taluka, Bagalkot district of Karnataka. While the warrior-sage washed his axe beyond a sharp turn in the river Malaprabha, unknown to him, village women were cleaning their clothes downstream. His mighty axe stained the entire river red, and the women exclaimed “Ai hole!” translating to ‘Oh, what a river!’. This is said to be the etymology of the present-day village Aihole. Parashurma finally went on to perform a yagna to cleanse his sins. He took a bath in river Saraswati, a river representing the Vedas; he shone like a cloudless Sun! He performed a yagna and donated the kingdom to Sage Kasyapa. Meanwhile the son of King Gaadhi became the celebrated Sage Viswamitra of extraordinary effulgence and abandoned his Kshatriyahood to embrace Barahminical ways of asceticism! This Nama, is in contrast to the earlier name ‘Upendra’, in the same Shloka. This means ‘Ateetya Indram Sthitah Jnaana Aishvaryaadibhih Svabhaava Siddhaihi iti – He is called Ateendrah because he surpasses Indra in all aspects including Knowledge and Wealth as well as natural accomplishments’. Swami ChinmayAnanda points out that in Vedanta, Indra stands for mind-intellect, and the ParamAtmA or the Pure Self is superior to mind since it transcends the mind. Sri Parasara Bhattar gives the interpretation ‘Atha Bhaktaih Ayatnena Sangrihayata iti Sangrahah’ – One who is reached by His devotees without any effort (other than pure devotion). Sri Adi Sankara gives the interpretation ‘Sarveshaam Samhritau Pratisamhaaraat Sangrahah’ – One who withdraws everything into Him during pralaya or the deluge. Swami ChinmayAnanda gives the interpretation that Bhagavan is Sangrahah because he holds the entire world of beings and things together. ShrI Satya Vasishtha looks at this name as sama + graha, or holding everything together in one form, viz. by being the resident soul in everything. The root word is ‘Srij’ meaning to create. Sri Adi Sankara defines the name in 2 ways as ‘Srijya roopatayaa Sargah etutvaat Vaa – He is Sargah either because He is in the form of His creation, that is the Universe or because He is the cause of creation of the Universe’. In other words He is both the Universe and its Cause. He has created the Universe out of Himself. As the Upanishad says ‘Poornamadah Poornamidam Poornaat Poornamudachyate. Poornasya Poornamaadaaya Poornameva Avashishyate – He created the Perfect Universe out of Himself and still remains perfect’. Sri Parasara Bhattar interprets this to mean ‘Dhritah Atma yena Sah Dhritaatmaa’ – One who supports all the Jeevaatmas or One who supports (conducts) Himself uninfluenced by any change. Sri Adi Sankara’s interpretation is ‘Eka Roopena Janmaadirahitatayaa Dhrita Aatmaa Yena Sah DhirtAtma’ – He consistently bears the same form and same nature right through his manifestation because he has no beginning. He has no changes like birth, likes, dislikes etc. He is always the same. Sri Adi Sankara gives the graphic description of Niyamah as ‘Sveshu Sveshu Adhikaareshu Prajaa Niyamayati iti Niyamah’ – He allocates the respective duties and powers to the different beings. The root yam has two meanings: Yam Uparame – to check and Yam PariveshaNe – to surround. One who is the Creator of all beings is also naturally the Controller of all those beings. It is HE who orders all the mighty forces of nature and prescribes for each the laws of their conduct, the ways of their behaviour and the methods of their functions. The Sun, Moon, Air, Waters, Death, etc., are all appointed and controlled by the Lord. In other words He is the Controller of the Universe! ‘Yah Aatmaanam Antaro Yamayati – He who rules the self from within’. Hence, Bhagavan controls and rules the world and the Jivatmas from outside as well as from within! Bhagavan assisted Indra to regain his kingdom and hence He is known as Upendrah. By taking the dimunitive form of a Brahman, He sought Bhiksha from Mahabali and hence He is called Vamanah. He transformed into a ‘Giant Trivikrama’ even as Mahabali was in the process of completing the Arghyam for gifting three feet of Earth and hence He is Praamshuh. His acts always have a purpose and hence He is Amoghah. Bhagavan is pure as he is unattached in his actions or in the fruits of his action, hence He is Shuchih. He has immense strength and hence He is Oorjitah. He is Ateendrah as He is superior to Indra in all respects. He is Sangrah as He can be easily attained by devotees through Bhakti. He is the Creator of the Universe and also the Universe is within Him, so He is Sargah. 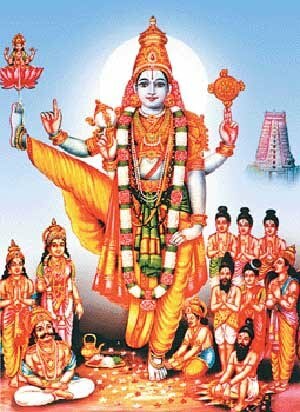 He supports all Jivatmas and controls all the functions that are essential to sustain the Universe, hence He is Niyamah. He is the Controller and controls the earth from outside and Jivatmas from within, so He is Yamah. Thank you Mr. Sridhar & Mr Shri Balaji for this wonderful narration. Immensely divine!!!! 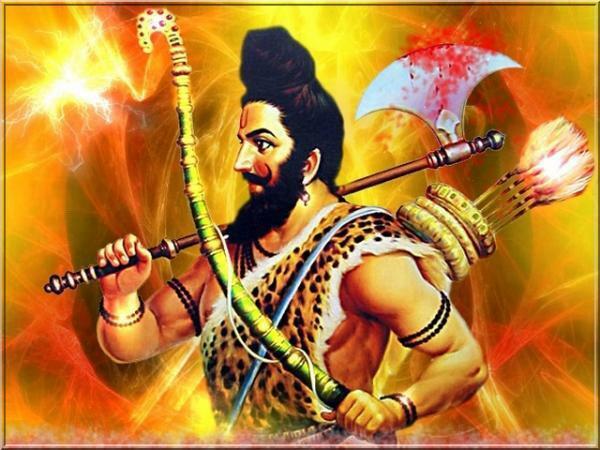 Thank you for such an amazing commentary on Parushuram. Can read them a 100 times. I am reading as well as following your youtube as it is giving me a lot of bliss. Beautiful images & story. Thank you very much both of you. I loved the video on youtube too. Parushuramar & Vamanar stories are very very interesting. I am commenting on behalf of my friend Aishwarya too. Hari Om! Apologies, Mr. Sridhar & Mr.Shri Balaji! I missed this post yesterday as I was travelling. Beautiful, simple & lucid narration. The role of Parushuram is very powerful. A great warrior & very righteous. I have watched a live drama of this, very intense character. Thank you yet again for this awesome story of Parushuram & Vaman both are evergreen. It’s Interesting to read about Parasuram.